Before pacing calendars, before the hysteria of Common Core Learning Standards, before preparing four and five year olds to be college and career ready, there actually were some wonderful classroom opportunities for opening doors and embracing unexpected opportunities for learning. Many years after the fact, (actually eighteen years later) I can recall one of those special moments. It was September 1996, the start of another teaching year with a new group of kindergarten children. As I did most years, I encouraged each child to bring a favorite storybook from home to share with the class. These books were kept in a special “sharing basket” and each day I picked a few to read aloud. I never, ever would have predicted what was going to happen when I picked Lee’s book to read. I truly enjoy reading most children’s books but there’s one series that I find particularly tedious and uninspiring, the Berenstain Bears books. However, as much as I avoided reading them to the class, the children seemed to equally love each one in the series. Why? I couldn’t quite figure that out but, nevertheless, there’s obviously something in the humor of the adventures that appeals to five year old children. Lee’s book was The Berenstain Bears’ Camping Adventure and the minute that I finished my reading, the sounds of “read it again” rang out all around the carpet. O.K., I’m a rather obliging sort so I did it – I read it again. Each day that week the children asked if I could reread that silly tale of a bear family’s adventurous camping trip. Finally, after about the fourth reading that week, I put the book aside and asked if anyone in the class ever went on a real overnight camping trip in the woods. A small sprinkling of hands went up. Most of the children had never gone camping. With the excitement beginning to reach a high pitch, I lifted my hands to indicate that it was time to settle down and I said, “Let’s think about it and talk about this tomorrow.” I wanted to see if the idea would sustain over night and I also wanted to think about this crazy idea that I had just proposed! The next day the children came to school buzzing with excitement about our camping trip. Their parents, on the other hand, looked totally confused. 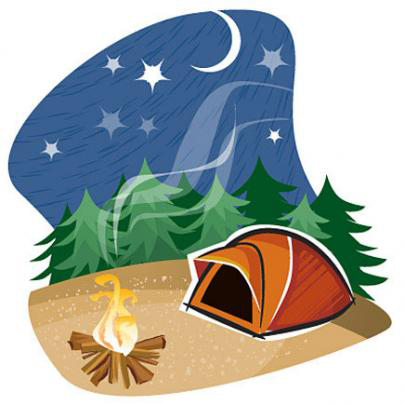 It’s September and you’re taking my five year old on a camping trip…and at night? What kind of crazy teacher did we end up with this year? I certainly would need to send out a class newsletter very soon! At our morning meeting, we couldn’t seem to move away from the topic of a classroom camping trip. They were just too excited, so I asked the children to talk to each other about what they knew about the forest and about camping trips. Then we had a class share. All different themes and concepts, seemed to present themselves: forest animals, dangerous animals like tigers and elephants, trees, flowers, bears, Goldilocks and the Three Bears, starry skies at night, camping gear like tents, sleeping bags, and flashlights, campfires, roasting marshmallows, etc. I told the children that, if we were going to do a good job of turning our classroom into a forest and getting ready for a camping trip, then we would have to do some research. This new word warranted a longer discussion so it was tabled for our next meeting. When I came back to the topic and began to discuss research with the children, we brainstormed for ways of getting information. An interesting comment on the time that this took place is that nobody suggested that we use the Internet! Reading books and talking with people who had experience seemed to be the most popular suggestions and hence began our first experience with reading centers. Children were encouraged to bring in books from home, if they had them, on any of the topics that we listed. I also suggested that we look through our classroom library and I scoured the school library and our very well stocked bookroom. We organized baskets of books on the different topics…Stars, Goldilocks and the Three Bears, I added Little Red Riding Hood, Forest animal books, books about flowers, books about trees, and so forth. I then spent a few days on some partner-sharing minilessons with practice time on the rug. Children picked partners. I made a chart listing the different topics and partners signed up for a basket of books that they would spend two (or possibly three…my memory is failing on this detail) days reading together. There were generally two sets of partners to a basket. At the end of each reading center time, all of the children at the center were encouraged to talk about what they discovered from their books that day. At the share meeting, I did the sharing. I shared my observations of what I noticed about the way children were working together, focusing on the positive. We began listing our discoveries (there were no tigers or elephants in any of the forest books! ), we set up some new centers based on what children were discovering (at our second choice of centers, we added a birds in the forest center) and children drew pictures of things they wanted to remember from their center. We had about three rounds of centers so each child got to spend time in three different reading centers. Now we had lots of information and we brainstormed for choice time centers to help get our class ready for the camping trip. In the block center, children build a forest and the house of the three bears. (We added teddy bears to the block center). In the dramatic play center the children were playing some sort of variation of Goldilocks and Red Riding Hood. We had a star center where the children made stars and constellations (their own constellations) that I hung from the light fixtures. In the art center children were using construction paper and cardboard dowels to make trees and flowers. Some children painted a forest mural. My student teacher made trail mix with a group at our cooking center. Playdough birds and animals were sculpted. It was, needless to say, a busy time. 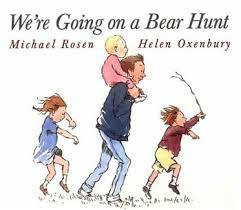 On camping day we sang and went of a bear hunt. We made a hiking line, with each child carrying a knapsack, and walked past the home of the three bears in the block corner. We sang The Happy Wanderer, a new song that I taught the children, “I love to go a-wandering, along the mountain track. And as I go, I love to sing with my knapsack on my back.” We spoke about all of the things that we were seeing along the way – birds, little animals, flowers, trees, bears, (teddy bears!) and finally stopped when we came to our “campfire.” The children spread out blankets that were in their knapsacks and I gave out our sticks and marshmallows. We “roasted” and ate the marshmallows and chomped on the trail mix. Then, the lights went out and it was nighttime. I read a spooky story by the campfire and then the children stretched out on their blankets. We passed around the flashlight as we sang the star counting song and when the lights went on, it was morning. Time to pack up the knapsacks and say goodbye to the campout day! I guess this camping out experience was an unusual way to begin the school year. It was the only time that this happened because it fit perfectly the experience with The Berenstain Bear’s Camping Adventure book that Lee shared with us. But as I reflect on this experience it makes me think about the emphasis that so many teachers put on spending the first month (or months in some cases!) on learning routines and “getting to know each other.” When we finished this mini experience, we all knew so much about each other. I really didn’t need to spend much time on teaching routines because they fit so comfortably and practically with all of our activities. The children learned them quickly and they most certainly got to know each other and feel a comfortable ownership of their classroom. That’s what we want, isn’t it? The children understood that they could get both enjoyment and information from books and that it was important to have discussions to further their understanding. They learned how to use the materials in the classroom. We also started out the year with a significant bonding activity that set a precedent for the year ahead. As Winnie the Pooh said, “As soon as I saw you, I knew a grand adventure was about to happen.” I think the children in my class knew that we were about to have a year of adventures in our kindergarten…and we did! This entry was posted in Investigating Choice Time: Inquiry, Exploration, and Play and tagged Berenstain Bears, camping, Choice Time, Common core learning standards, Goldilocks and the Three Bears, reading centers, The Happy Wanderer, We're Going on a Bear Hunt, Winnie the Pooh on April 25, 2014 by Renee. Loved teaching 4 and 5 year olds because each year is different. What sparks one class cannot be replicated but the process to explore those sparks was the teaching. I am Facebook friends with many of my kindergarten students from the late 1980-2001… Happy to find out from many of them that they remember those same sparks I remember. Thanks for your post tonight. What an inspiring story! I’m sure your students were enchanted. Please continue to share stories of your own teaching on the blog! How wonderful your classroom was! Thank you for sharing. I am glad someone else disliked the Berenstain Bears as much as I did. They were among my daughter’s favorites as well. Wonderful that that particular book is the one that inspired the camping trip. Most of all I love how much they researched and learned from this experience. I am sad that I don’t see classrooms with learning centers. My granddaughter’s kindergarten was empty except for tables and chairs. Made my heart ache. LOVE this!! It is the epitome of teaching FROM the kids using their inspiration and following through with improvisation allowing them to BE the adventure. All I can say is that I wish my kids had had you as a teacher!! Miss you! I have had a strange year with my Dad and all and blogging has taken a back seat. I really miss it and need to get back to it! Thanks for inspiring me to do so! Wonderful story. What an experience. Talk about grabbing hold of a teachable moment! What lucky little ones you had! Fabulous story, fabulous way to begin the year. Thanks!